One 0.6A Compact smart charger for charging the included pack (12V 2200 NiMh pack). 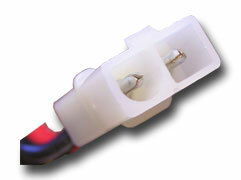 Charging / Discharging Terminals: 4.5" 18AWG Standard Male Tamiya connector. Smart Charger: please choose our 0.6A Compact smart charger to charge this battery. Charging time is 5.5 hours. Need standard Dean Connector? Please click for DIY by standard female dean connector. AFTER RESEARCHING QUITE A FEW WEBSITES FOR WHAT I WAS LOOKING FOR, I BOUGHT FROM BATTERYSPACE. IT HAD WHAT I WANTED IN STOCK AND THE SITE WAS HELPFUL WITH MY QUESTIONS. I WILL BUY FROM THEM AGAIN.